It's not often that judges and courts decide the fate of a wild killer whale -- and it's always a slightly discomfiting intersection of man and nature when they do. But within the next couple weeks and as soon as Wednesday, a Dutch High Court will issue its decision on the future of Morgan, the lost and sickly young female killer whale who was picked up off the coast of the Netherlands in 2010. After being nursed back to health by Dolfinarium Harderwijk, Morgan was shipped off -- following a decision by the Dutch government -- to Loro Parque in the Canary Islands in late 2011. The rationale: releasing her back into the ocean was a risky proposition, and she would do better in captivity if she had the company of other orcas. The decision to send Morgan to live at Loro Parque with five SeaWorld killer whales (instead of giving her a chance to return to the wild), has been hotly contested in a series of court cases that have been spearheaded by orca expert Ingrid Visser and the Free Morgan Foundation. The upcoming ruling could settle the debate -- and dictate how and where Morgan will spend the rest of her life -- once and for all. If the appeal is denied, "nothing less than her life is at stake," Visser says. "She will die in that tank, whether two years down the track or 10 years." Since Morgan first arrived at Loro Parque in late 2011, Loro Parque has insisted that Morgan has adapted well, and been integrated successfully into the group of five SeaWorld killer whales that have been at the facility since 2006 and whose troubles, and aggressions against trainers (fatal and near-fatal), I chronicled here. And, finally here is a celebratory video that marks her recent two year anniversary at the park. It's a very moving and effective use of video and music to create a positive narrative of Morgan's life at Loro Parque. Ingrid Visser, however, has spent countless hours researching and chronicling a completely different narrative: that of an abused and bullied young orca that is suffering, instead of thriving, at Loro Parque. 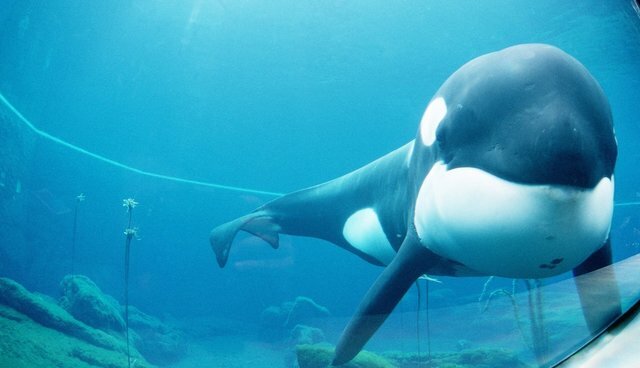 It is the narrative she has been pressing in Dutch courts, and it is a narrative that directly undermines the key rationale used by Dutch authorities to send Morgan to Loro Parque: that her interests and well-being would be better served at Loro Parque than in a sea pen or in an effort to reintegrate her into the wild. Visser Note: During a training session, Morgan (partially obscured behind rail), rises out of the water in an attempt to avoid a bite from one of the two orca in the tank with her (Skyla and Kohana). Visser Note: Morgan (head out of water, on right) as she is rammed and pushed backwards by the two female orca, Skyla and Kohana. Visser also noted that Morgan displays stereotypical behaviors which indicate boredom and alienation. For example, she documented Morgan chewing on the pool walls. Visser has used her research, and the picture of Morgan's life at Loro Parque it depicts, to argue repeatedly that Morgan is suffering and that the premise for her move from Holland to Loro Parque (that she would benefit from the company of other orcas) is thoroughly flawed. Loro Parque, in a statement e-mailed in response to a request for comment, calls Visser's argument "erroneous and misleading," as well as "emotionally charged. The statement goes on to try and rebut each of Visser's claims one by one, and dismisses Visser's work as an "animal activist opinion piece." For Morgan, the statement flatly states, "negative welfare conditions do not exist." "I'm not an activist. I am a scientist who happens to care about the welfare of animals," Visser responds. "There is a big difference." Moreover, Visser's research and conclusions about Morgan's life at Loro Parque has won an interesting advocate in Jeff Foster, who spent decades catching killer whales, dolphins, and other animals for SeaWorld and other marine parks. Foster knows a lot about killer whales and how they handle captivity, and is not opposed to captivity for killer whales if they are well-integrated into a stable environment. After observing Loro Parque's videos of Morgan he was initially skeptical that her experience at Loro Parque was as negative as Visser believes. But based on two trips to observe Morgan (the most recent was last Fall), Foster says he fully agrees that the group of SeaWorld killer whales at Loro Parque is dysfunctional, that Morgan has not been well-integrated, and that Morgan is suffering. "It's pretty obvious. She's crying out in distress almost all the time," Foster says. "You usually don't hear those vocals from animals unless they are really in distress. The only time I've heard them is when we were catching whales and separating them from their families." Foster says that when he visited Loro Parque Morgan was mostly kept isolated from the other killer whales in the small medical pool, and that she looked very lethargic. "She's like the red-headed step-child and is being picked on by the other animals," he explains. "I think there is no question that if they can't integrate her into that killer whale group she will succumb to some sort of illness or stress-related problem. And I don't think she will ever fit in." Foster also dismissed concerns that Morgan's hearing impairment would prohibit her return to an ocean environment. "There are plenty of animals out there who have loss of hearing or are blind, and they do fine out there," he says. "These animals are very adaptable. If we could integrate her into her family or another group then she should be fine." If the Dutch court does conclude that the decisions sending Morgan to Loro Parque were incorrectly made, there would presumably be ongoing legal proceedings required, likely in Spanish courts, to try and remove Morgan from Loro Parque. If Morgan gets pregnant, however, any effort to move her from Loro Parque could be short-circuited. That is the X-Factor that Visser worries about most. She believes that Morgan is being placed frequently with Keto, who has sired two calves at Loro Parque, for just this reason. A recent medical assessment of Morgan, commissioned by Loro Parque, indicates that Morgan, who is believed to be 5-6 years old (Visser thinks she could be a little older), noted the recent onset of "ovarian cyclic activity." Most wild female killer whales don't give birth for the first time until they are a few years older than Morgan. But Kohana, a female at Loro Parque with Morgan, got pregnant with her first calf when she was just about 7. So, Morgan appears to be entering a life stage where pregnancy is possible. SeaWorld spokesman Fred Jacobs declined to respond to an email asking for clarification regarding the basis for SeaWorld's claim of ownership, and it is not clear that SeaWorld's claim is consistent with either the Dutch decision to send Morgan to Loro Parque, or the CITES permit which was required to transport her. But Naomi Rose, a killer whale expert with the Animal Welfare Institute, calls the question of Morgan's ownership, and the European laws that might apply, "clear as mud," and doesn't expect a clear resolution because no governments or courts seem eager to dig into the issue. "Normally this problem doesn't arise -- a facility captures an animal from the wild or an animal is born at a facility and, de facto, that facility owns the animal," she says. "But what about when an animal strands and the laws of the country in which that animal strands say that any marine mammal taken from the sea as a rescue must be rehabilitated and returned to the sea, unless that is not possible. Who owns her then?" These debates (whether Morgan should be at Loro Parque, and who "owns" her), and the fact that her fate is in the hands of governments, courts and corporations, highlight how far Morgan has traveled from her life as a killer whale in the wild to her new life as a killer whale in the human world. Visser has now spent three years doing everything she can to try and reverse that journey and win Morgan a life that is somehow more natural and less stressful than the life she leads at Loro Parque. But the imminent court decision could be the last chance to truly alter Morgan's fate. "Clearly these animals are being abused in captivity, and it's time the general public, including judges, realize what has been going on," Visser says. "Morgan is the poster child for that, and represents so many things that have gone wrong on so many levels. If someone like myself, as a scientist, isn't going to stand up for her then who the hell is going to?"